Presented here are the choices for Player Characters. I added this in so you could get a glimpse of what the character sheets will look like and become familiar with the terms and characteristics within. (1)Title and Level shows the character's current level [Level] and how much experience points (Exp)	are needed to advance to the next level [NEXT]. (2)Character Data provides information such as name, physical parameters, motivations and personality. (3)Attributes represent development of physical and mental parameters. Initiative reflects how quickly you act in battle. Derived from Agility. Reflex is your ability to dodge or defend against incoming "mundane" attacks and obsticles. (6)Character PortraitDraw your Persona User! A place to show your character. (7)Posessions lists items and things carried, the Equipment block shows what's equipped on your character, and any Damage Reduction and other abilities they provide. (8)Backround is a place to fill in backround information on your character and other similar data about income and housing. (9)The Weapons portion of the equipment sheet details any frequently used weapons your character possesses or uses. (2)Attributes represent your Persona's physical and magical abilities. Attack is how skilled your physical attacks are, representing your ability to hit an opponent. Defense represents your Persona's ability to withstand and dodge physical attacks. Magic Defense represents evasion from magical attacks. (3)Arcana of your Persona, and level-up bonus gained from that tarot. Wk: You are Weak to this element. Attacks of that type will deal double damage and can potentially knock you down. --- : No resistance. You're neither strong nor weak against this element. Str: You are Strong versus this element and take half damage. Nul: Damage from this element is nulled. Drn: Damage from this element heals you instead of dealing damage, replenishing your HP. Rpl: Damage from this element is repelled back to the attack. You take no damage. 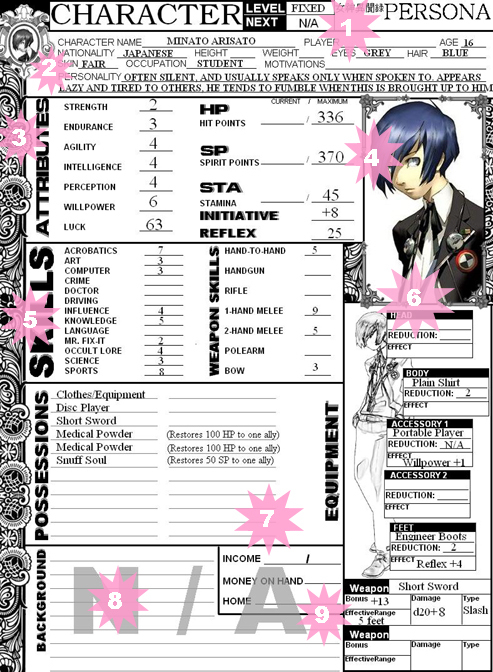 (6)Spells and Abilities lists your Persona's known magic and special attacks, along with their cost (in SP or STA), useable range, and effects.